A fancy name for this brew, though it is a farmhouse ale from Northern France. I recall my first encounter with Biere de Garde. I had no idea what it was. I was with a pal who was living in Paris on the Rive Gauche. He took me to a place with a big blackboard covered with the names of different specialty brews. The waiter said something unintelligible to me. My friend said “He’s asking you what you want.” I looked at the board and said “Jenlain” because I liked the name. C’était un choix fortuit. We’d just had a big meal at a restaurant on the Champs Elysees. The waiter brought a mug that contained at least a liter and a half of beer. “Wow” I thought, but over an hour’s conversation I managed to drink it all. My friend asked “Do you realize you spent $20 on that glass of beer?” I’d just been in Japan where the exchange rate was 135 yen to the dollar. The beer was 65 Francs. I thought that was cheap. It wasn’t–but it was delicious. And the view of the Tour Eiffel was great. 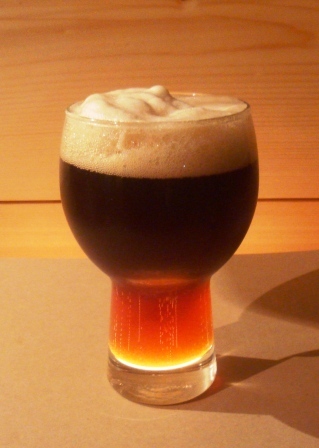 Biere de Garde is the French cousin of Belgian beers from Flanders. This one uses yeast from the Flemish region, very close to the Belgian border, White Labs WLP 072 French Ale yeast. It’s the real secret to the complex flavor, a clean strain that complements maltiness with estery fruitiness that is much milder than many of the Belgian strains. The grain bill for this version of Biere de Garde features a step-infusion of Belgian specialty malts, together with pale malt, Vienna malt, cara-pils and dark wheat malt. A blend of seven grades of crystal malt plus dark Belgian candi sugar add full-spectrum caramel flavors. Aromatic malt contributes–aroma! A teaspoonful (12 grams) of coarse gray sea salt from Brittany creates subtle roundness of flavor. I wish I’d had some authentic French hops for this attempt, but they’re hard to come by in Southern BC. Instead I used my homegrown Fuggles and Willamette hops for bitterness, flavor and aroma. It turned out to be a good thing–lots of full-spectrum hop presence on the palate and nose. Starting out at around 15.5 Plato (1.062) and finishing at about 4 Plato (1.016) the beer has about 6.4% ABV. Copper color, malty nose, bitter finish, slightly sweet, it’s a roundly-balanced high-amplitude beer that won a bronze medal at the Calgary Yeast Wranglers competition. Despite it’s name it is no surrender monkey. This entry was posted in Uncategorized and tagged ale, beer, Belgian Beer, Biere de Garde recipe, fermentation, Flanders Beer, homebrewing, umami.